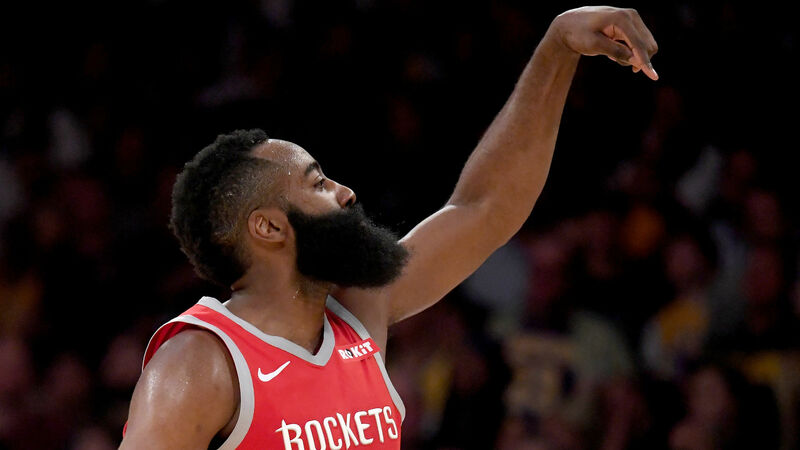 Los Angeles Lakers head coach Luke Walton has one very important goal against the Houston Rockets, keep MVP contender James Harden under 50 points. Reigning NBA MVP Harden has scored 57 and 58 points in his last two games at the Toyota Center. Harden is averaging an NBA-best 35.4 points and has scored 30-plus in 18 consecutive contests. The Rockets have gone 13-5 during that stretch while Harden has engineered three 50-point games and eight 40-point games. Los Angeles are hoping to extend their two-game winning streak when they face the Rockets on Saturday and Walton singled out the threat of Harden. "If we can keep him anything under 50, we feel like we've succeeded as a group," Walton said jokingly. "If he scores over 50, then the game plan did not work." Walton added: "He's going to get fouls, he's going to get three-point shots, he's going to score. "He's on an unbelievable tear right now. We just got to keep fighting and playing through all of it." Los Angeles (25-21) are looking for their first three-game winning streak of the new year. The last time the Lakers had a three-plus game win streak was the end of November. They will continue to play without superstar LeBron James (groin) for the foreseeable future. The timetable for his return is unclear and according to a recent interview with James' agent, he will not rush his comeback.